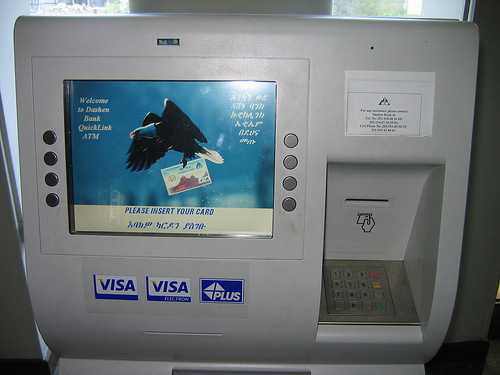 ATMs/Cash Machines – are found throughout Addis Ababa. Dashen Bank is a principal member of both VISA and MasterCard International and has deployed 55 ATMs in Addis Ababa and around the major cities like Bahirdar, Gondar, Mekelle, Awassa, Dessies, Nazreth, Dire Dawa and Harar. Some of the ATMs found at D.H. Geda Tower (next to Friendship City Center) accept both VISA and MasterCard, Dembel City Center (quite hidden, use the main entrance, than to the left, at the window), Edna Mall , in some hotels (Hilton, Sheraton, Intercontinental, Wabi Shebelle Hotel, Ethiopia Hotel, Semein Hotel, Harmony Hotel). Also near the National Museum (Lucy Gazebo Restaurant), ground floor of Getu Commercial center just at the entrance and some branches of Dashen Bank. Please note that not all cards are accepted everywhere, CBE ATMs are now internationalized and have touch screen technology. HILTON is best place to change/get money. It has 4 ATMs (outside near Hair Salons) and inside on ground floor two banks, Nib and United, have Foreign exchange bureaus that are very quick for changing your hard currency cash. Cash on Credit Cards at Dashen Bank and Sheraton but at 6% and US$500 max per day. Traveler’s cheques are difficult to cash in Addis Ababa. There is ATM at airport near at Immigration area next to banks. Since January 2011 there is ATM available in the Bole airport at the left side of the customs exit. Foreign currency can be exchanged at any commercial bank, including branches located at larger hotels and at the airports. Exchange rates are the same everywhere. Foreign currencies that will give you the best exchange rates are US dollar, euro and pound sterling. Recommended to bring are US dollars, as some banks will not accept other currencies. Note that it is illegal to change money on the black market. Exchange of birr back to foreign currency is only allowed for visitors holding onward ticket from Ethiopia. Availability of Automated Teller Machines (ATMs) is limited to larger cities such as Addis Ababa, Bahir Dar, Gonder and Mekele. The ATMs accept international Visa cards but they don’t work with Cirrus and Plus systems and also don’t accept MasterCard. Some ATMs in Addis Ababa dispense cash in both US dollar and birr. Credit cards can be used in some places like hotels, airline offices or travel agencies in the capital Addis Ababa, but, with some exceptions, not outside of the city. Some banks will give you cash advance on a credit card. Most accepted cards are Visa and MasterCard and typically merchants add additional 3-5% to the bill when using them. Traveler’s checks can be cashed in banks, but are difficult to exchange outside of Addis Ababa. Best rates are offered for checks in US dollars or pounds sterling. Usual banking hours are 8:00am to 3:00pm, Monday – Thursday, Fri 8:00am to 11:00pm and 1:30pm to 3:00pm on Fridays and 8:30am to 11:00am on Saturdays. You are currently browsing the archives for the ATM LOCATOR ETHIOPIA category.